Considering I had nothing on hand and no ingredients etc available in the Lowveld. 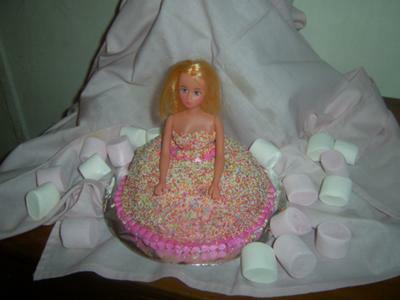 I came up with this quick and easy Barbie Cake. Bake a cake in a pyrex dish turned it out, iced with pink butter icing and sprinkled hundreds and thousands all over the cake and added sweets. You did a fantastic job!!!! !